BillyMaysHere.com is devoted to Billy Mays, the many products he endorses and of course his catch phrase "Hi, Billy Mays Here". The unimaginable has happened: Billy Mays, the king of television commercials has died. That's right, there will never be another Billy Mays infomercial filmed, no more superb Billy Mays products like Big City Sliders, OxiClean or OrangeGlo, and no more "Hi, Billy Mays Here". Billy Mays, the man, the legend will truly be missed. R.I.P. Billy, you will always remain 'here' in our hearts and in television history. Billy Mays: King of "As Seen on TV"
I don't care what you haters say, Billy Mays is the man! No one is better at selling products, I can hear his enthusiasm from the next room whenever one of his AWESOME infomercials comes on. But wait there's more: try playing all the above videos at once. Billy Overload! "It takes the hard-work out of yard-work!" After getting his start advertizing Orange Glo cleaning products on the Home Shopping Network, Billy has risen to the top of television advertizing, becoming a household face and name. But how did he do it? 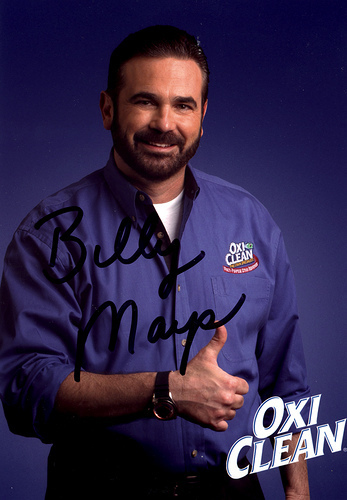 His claim-to-fame catch-phrase "Billy Mays Here" was only part of it. Billy rose so quickly to advertizing success because of his amazing enthusiasm. Billy's enthusiasm could sell any product, but when you combine it with such incredibly useful and innovative products as Big City Sliders, you get the unstoppable advertizing juggernaut that is Billy Mays. Billy Mays is here, and he's here to stay whether you like it or not.